Not that they're much better, really. Only 4 more blocks to go! Wow! They all look GREAT!!!! That block #10 is my favourite in her quilt-along, and the turqouise fish fabric really shows off the star well. The designer BOM block looks really difficult! The fabrics are yum! The blocks look wonderful and the quilt top is going to be great. 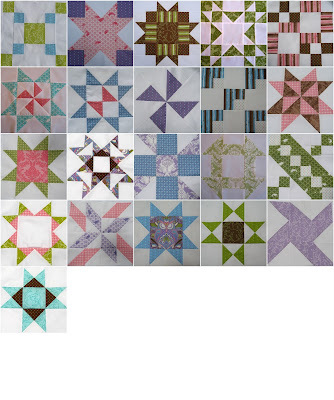 So you're making one quilt with the blocks from both quilt-alongs? I REALLY appreciate and relate to the fact that all your fabrics are facing the same direction... especially evidenced in Block #10. I first noticed the fish fabric's right direction, but then you also note the Raspberry Raindrops are facing the same direction. Your blocks all look great! I need some good time at my machine . . . Awesome color combo! You are a bold designer. I love how the fabrics have a matching personality and yet very disparate colors, it all goes so well. I took a wrong turn at week 4 and need to get back on track. I will have to squeeze 8 weeks into one. good luck, huh? it's great to see all your blocks together. your quilt is going to be fabulous.